I do not exaggerate when I say that I believe that Akata Witch has the most stunning cover makeover in all of YA. I simply can not take my eyes off of it. That is why I am so thrilled to be part of the paperback release blog tour. 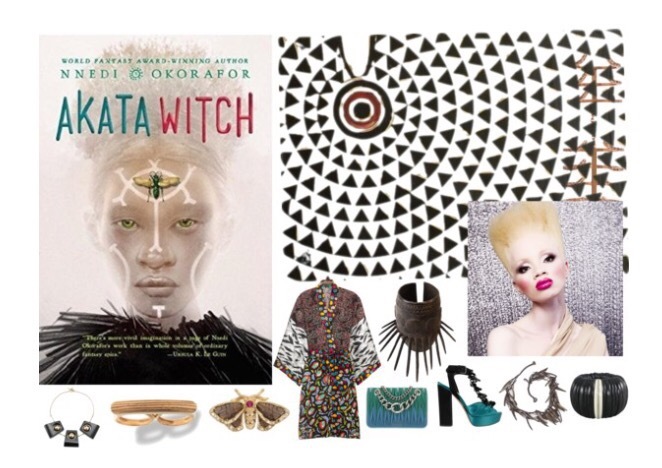 Today, I feature a fashion set inspired by the new Akata Witch paperback cover. World Fantasy Award-winning author Nnedi Okorafor weaves together a story of magic, mystery, and finding one’s place in the world–for fans of Ursula Le Guin and Diana Wynne Jones. Twelve-year-old Sunny lives in Nigeria, but she was born American. Her features are African, but she’s albino. She’s a terrific athlete, but can’t go out into the sun to play soccer. There seems to be no place where she fits. And then she discovers something amazing-she is a “free agent,” with latent magical power. Soon she’s part of a quartet of magic students, studying the visible and invisible, learning to change reality. But will it be enough to help them when they are asked to catch a career criminal who knows magic too? I put together my fashion aesthetic set and attempted to feature as many Nigerian designers and influences as possible. Since Sunny is albino, I featured South African model Thando Hopa in full make-up for the make-up aesthetic of this post. Through my research, I found a Nigerian designer that I wanted to feature. His name is Duro Olowu. He began his women’s ready-to-wear line in 2004 and his empire-waist patchwork “Duro” dress was named “Dress of the Year” by both American and British Vogue in 2005. He’s a London-based fashion designer who draws on his Nigerian roots and combines and plays with patterns and textures uniquely his own. Enter for a chance to win one (1) of five (5) sets that include the paperback of AKATA WITCH and a galley of AKATA WARRIOR (ARV: $10.99 each). NO PURCHASE NECESSARY. Enter between 12:00 AM Eastern Time on July 17th, 2017 and 12:00 AM on August 7, 2017. Open to residents of the fifty United States and the District of Columbia who are 13 and older. Winners will be selected at random on or about August 5, 2017. Odds of winning depend on number of eligible entries received. Void where prohibited or restricted by law. Please check out the reviews and creative content from all our extremely gifted blogging friends! Finally, I wanted to leave you with one more shot of Thando, which struck as resembling the aesthetic of the Akata Witch & Akata Warrior covers. Absolutely love the fasion😍. I’m currently reading Akata Witch and it’s amazing. I love Sunny and Chichi. I agree with you about the cover redesign. The old one was nice (and I still like it), but I really love the new ones for Akata Witch and Akata Warrior. Yeah, they are jaw-dropping. The team did an excellent job with this redesign. I’ve read two books by Nnedi Okorafor so far and I love her – I can’t wait to get to this series, especially with these new covers! I have been hearing about this book nonstop for the past few months. I’m super excited to pick it up. You definitely should! The 2nd book series comes out in the fall, so it’s a perfect time to read it!